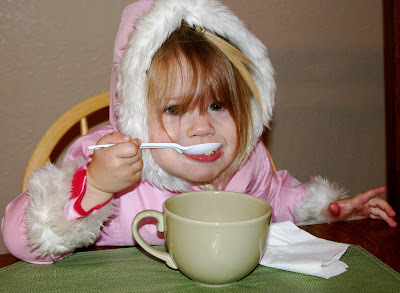 Alaskim | Surviving Wildlife, Wildflowers & Wild-Haired Children: Guess Who Likes Her New Coat? My kids are the same way with new clothes. They certainly aren't deprived of new clothing, but you would think otherwise upon seeing their reaction to new stuff!! Sometimes soup seems to taste better in a mug. Especially a giant mug! Love it! Can I have it? Lol! Think about how much COFFEE That one holds!! That's adorable how she even has her hood on. "Geez mom, turn up the heat in here, will ya?!" Lol! Awww, but she looks so darn adorable!! So what's a few soup stains?? As if you need more laundry, right? The beginning line of this post reminded me of a funny book I read a few months ago called "I was a Good Parent before I had kids"...ain't that the truth? I'm right there with you! Oh so cute. u r so funny! BTW, do your girls have hanna andersson snowsuits? they are so cute and colorful, they look like hanna's. G-yes! good eye! Those are Hanna snowsuits--I bought them big, so the girls can wear them at least 2 winters. They're so expensive, I'll probably make the girls wear them a third year just to get our money's worth! Yeah...it is all about picking your battles! That is definitely the truth. It is amazing what we will do when we are tired and stressed and just want some peace and quiet!